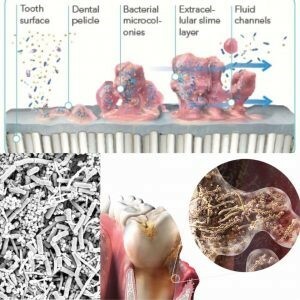 McCreight Progressive Dentistry > For Clients > Blog > Periodontal Care > What Is Biofilm? If you are an existing client of McCreight Progressive Dentistry you have heard the term ‘Biofilm’ more than once. In fact, most of our dental clients have tools that disrupt oral biofilm at home. These may include a Sonicare toothbrush, WaterPik, or PerioProtect trays. With all that you do at home have you ever taken the time to learn what biofilm actually is? How about getting rid of it? Biofilm is a well-organized colony of bacteria clustered together to form microcolonies. These colonies of bacteria attach to surfaces where they assume different characteristics from free-floating bacteria. Some call biofilm bacterial plaque. This adheres tenaciously to tooth surfaces, restorations, and prosthetic appliances such as dentures or implants. Understanding the formation, composition and characteristics of plaque helps in its control. An acquired pellicle is a layer of saliva that is composed of mainly glycoproteins and forms shortly after cleaning of the teeth or exposure of new teeth. Bacteria then attach to the pellicle layer, form micro-colonies, and mature on the tooth. This can result in oral diseases such as gum disease and cavities. Oral Biofilm is made of both anaerobic (without oxygen) and aerobic (with oxygen) bacteria and can be found anywhere in your mouth; tooth surfaces, tongue, cheeks, etc. This is concerning to us as dental professionals because these complex colonies can form a slime layer that can become resistant to antibiotics. This may cause much larger systemic issues such as heart disease and diabetes. The maturation period is only around 21 days after mechanical debridement or what is called preventative care. This is why most clients could benefit from a shorter interval in between cleanings, ideally every 3 or 4 months. It is also why your home care is very important. What’s neat about everything that we suggest to you for home care is that it is ideal for disrupting the bacteria’s environment. Hydrogen peroxide- something we recommend daily. Next time you’re in let’s chat more about getting those gums healthy helping you be healthy overall.